Got mine from EGlobal £122 and a week wait. Couldn't be without them now! Rumoured hands free "hey Siri" in the next version - that's why I'm waiting! Sod the helmet. Risk death whilst listening to some bangers. 100% NOT genuine Apple headphones. If you buy them thinking they are then you’re a sucker. Apple do not sell to resellers without a box. Try switching brands. Even the genuine ones are rubbish! Strange I too heard from a relative. Apparently my cousin is stuck in Nigeria and he's been take hostage by the Prince. 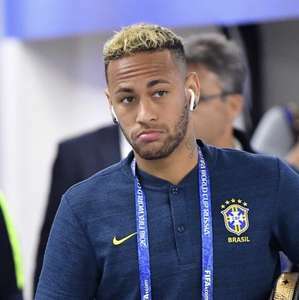 He attempted to steal us$3MILLION and now its stuck transferring to my bank account. If I pay the fees of just us$6k I can free him and the funds will be transferred. However this will means he's deported and never to return. Should. He return he may be beheaded if he's caught. Genuine apple earpods £8.99! Usually cost 29.99 according to the apple site. Delivery £1.99. Hope this helps. I have seen others comment they got fake MAC lipsticks and other dodgy cosmetics/designer gear from these shopping sites. Maybe some do sell bona fide items, depending on the retailer they're hooking up with - but I wouldn't take the chance. Agree with everything said here but don't trust trustpilot just have a look at the reviews for hotdealers favourite John Lewis, people only post when something goes wrong. Ipod nano's at least come with non mic/control genuine ones in box. I had a set. Though, odds are that they are indeed fake. Not "genuine". The only official Apple ones cost like £20 and obviously have a mic &amp; controls on them. I have bought Apple USB cables from amazon.co.uk directly before that turned out to be fakes (not even from a marketplace seller). I would only suggest getting them direct from Apple as there are so many fakes out there. Genuine ones have mic!! So how could these be genuine? As seen on Watchdog ! In don't suppose I can, but if the sound quality is as good, they look the same, and last the same time, then I don't suppose it matters. And how can you be 100% sure they're not fake? Can confirm that these are not fake, received in the post the other day, wife id happy. I and many others would buy a decent brand, that's much better value than apple, that's unlikely to be fake. That way you'll be getting quality without paying much more. i'm not talking about convincing looking,I'm skilled enough to spot a fake when compared to the real one side by side. there are reasons why items could be sold without outer packaging. the Apple earphones they sell are definitely real. How do you know? Do you have any proof or real experience or just comment because you are bored? 7dayshop never sell fakes,these are %100 real just iem without packaging. I bought them and they are %100 genuine.read reviews there too. eBay and Amazon are guaranteed to be fake but 7dayshop are real. No 7dayshop ones are all genuine. 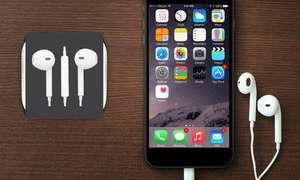 Never miss a 'Apple EarPods' deal again! I know everyone has their own budget but sometimes it really does pay back to spend a little more. Save a bit and look at reviews for earphones in the £20 range and you will be much more satisfied with your purchase. My headphones seemed to be legit if these are fake then the copies must be getting better sound quality was as too be expected and weren't tinny these feel like a real pair I understand why people wouldn't take a gamble as they seem to cheap to be true but I'm happy with my order. I get why so many people voted cold certain items people go mad at for example soon as beats by dre gone on here it's - 500 already it's a deal site regardless if you like the headphones you vote by the deal the price if beats by dre were to sell at £10 wouldn't surprise me if that went cold too. Do not buy from groupon sent me two sets of beats studio that were both broken . They were for kids Christmas presents . Fobbed me off on refund so went through PayPal . Then said they would refund me only if I closed PayPal dispute . 13 emails no refund they failed to respond to PayPal and they told me 10 times to close dispute against paypals advice . Spoke to PayPal and they said all groupon needed to do was to enter resolution centre to authorise refund but advisor from groupon wouldn't do it . Once again asked for me to close dispute . Once dispute is closed you have no comeback . How can a company behave like this . I will expose them !!!! And so should others !!! Your verdict m'lud. Guilty or not guilty? For me these are some of the most uncomfortable headphones going. They'd be a good novelty headphone in the 90's when everything was round and awkward, for 2015 I just can't believe they're a real product. I've got loads of these I never use, maybe I can start my own business! Is it just me or does everyone see a bottle of Domestos! I just received this and I can confirmed these are not genuine because the feel of the material compared to my genuine earpods is different. I bought some 'genuine' ;) ones from Amazon for £2.99, another reputable company (cough). Good price for them. Like Predikuesi, I find them to be a great fit and they sound pretty good too. I bought mine from Apple about a year ago and they are not showing any signs of wear yet. I recently bought a new iPhone, so I now have a spare set of Apple EarPods that are still sealed and they'll stay that way. If you know anyone who does want some Apple EarPods, they can have my brand new, unopened, ones for a tenner... just PM me! Don't feel disheartened. If sold in Tesco, at least, they are genuine - not the same as in a lot of other outlets. Don't be swayed by the temperature. It might be useful to someone else. Just keep posting! I add some heat as we paid more when we bought ours! Well for me the opposite is true. Every in-ear headphones I have used have not stayed in my ear and caused some irritation. These on the other hand have worked perfectly and are comfortable. Overpriced Apple technology though. The cheap ones - copies - on eBay are great (only last about a year for me, but cannot complain at the price. 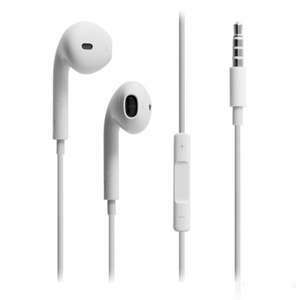 Genuine Apple EarPods With Remote and Mic - For iPad iPhone iPod Price includes delivery Cheapest place around! Anyone purchased these? Are they genuine or not? I doubt these are genuine, most or all of their apple stuff isn't. I think you need you ears checking mate. Worst ear phones ever invented. I've had a similar fake. You'd get more bass out of a couple of plastic cups and a piece of string than the ones I had. I previously have purchased from this seller... Definitely fake... Put ok the extra money and a buy the genuine product. 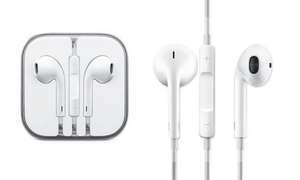 Genuine Apple earpods Shared Via The HUKD App For Android. I took a lightning cable as above, it just charged on and off rapidly (making phone vibrate nearly continuously), I got better results from a poundland one, at least that worked for a couple of weeks. Don't see how any company could get a supply of genuine apple products in little plastic bags. It's sad how they call these fakes genuine! I bought 3 different genuine apple items from them and all came unboxed and unwrapped except for some very dodgy looking plastic bags with some super home-made looking bar codes. (I bought the earbuds, sync cable and iPad charger) Their staff just claimed that they were bulk stock to explain the non-retail packed goods. I returned the lot for refund.